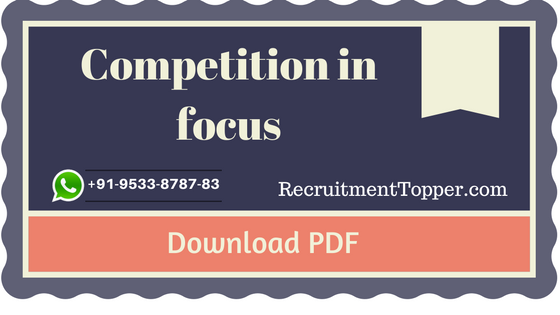 Competition In Focus, the complete monthly dossier from Arihant Publications serves as a refresher of the events & happenings, news updates and current affairs for a particular month. In this monthly dossier you will find coverage of Important Days & Dates, recent Appointments on India & World Level, the Resignations made and the Persons who Died recently. With a roundup of the news makers from around the world be it from any field i.e. the ones who won awards/ prizes, books & their authors and the places in news, the magazine also contains a Dateline section covering news of each day of the period for which the magazine has been published. • The World Affairs section maps the news & events from across the world that grabbed attention, whereas the National Scene records the recent developments & changes made in India. • The India & World section throws light on India’s relations with countries across the globe along with State Scene covering the major news & updates from the 28 states of India. • With Economy & Banking section the advancements in the world economy & banking sector have been mapped along with the Defence & Security section which marks the developments & issues concerning national security and defence services. • The Science & Technology section lists down the major breakthroughs in the field of science & technology comes along with Health & Nutrition section which throws light on the new devices & medications developed across the world. • Agriculture & Environment section counts the growth in biotechnology and agriculture in India & abroad and the Sports News & Updates from across the world are covered under the Sports Scene section. Apart from the above mentioned sections the magazine also contains solved papers of recently conducted competitive & recruitment examinations along with mock papers & practice sets for upcoming competitive & recruitment examinations like SSC, Bank PO, State PCS, etc. Also detailed articles on the major issues at the national & international level are covered in this magazine. Current Affairs have also been covered in the form of MCQs which will help in quick revision of the current affairs. The info crux section covers the major updates from the field of science & technology, economy, sports at the national & international level. At last a special section covering the ‘WHO’s WHO’, a list of personalities who have been in limelight at the national and international platform has also been covered in each issue.